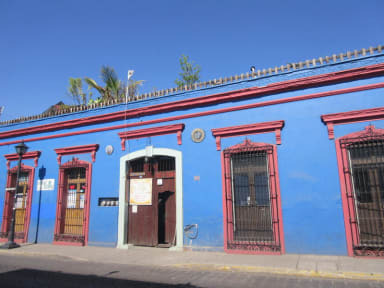 Luz de Luna Nuyoo is a small Hostel located in a beautiful colonial house at only three blocks from the main plaza. 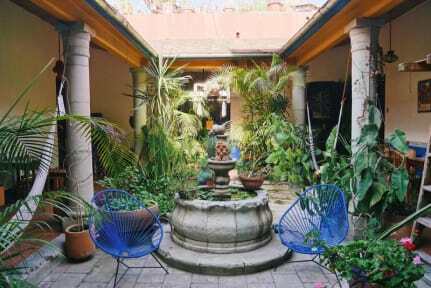 As you walk in the hostel the first thing you will see is the central patio, decorated with a variety of regional plants and the traditional fountain in the center, a cool escape from the typical heat of Oaxaca. The patio ambience is the ideal place to relax in its hammocks, read or meet other fellow travelers. Maria is very knowledgeable about Oaxaca and local activities. Wonderful ambient sounds provided in the communal lounging area with the waterfall and hammocks. There is also small space on the rooftop where you can contemplate or see the city from. Large bonus: conscious about waste and consumption here with all sorts of recycling. Would recommend to anyone looking for something down to earth and colorful. We loved our stay at this hostel it’s got super nice areas to relax in, it’s really social but also really chilled lots of hammocks etc...really comfy beds, nice breakfast, it couldn’t be in a better location and Maria and the guy who run it were so lovely and happy to help with anything. Beautiful family run hostel, with a really nice vibe. I stayed here twice. It's a very well run youth hostel and its staff person, Maria, is a gem; not only does she everything running smoothly, she is very knowledgeable about getting to places through collective taxis, rather than the far more expensive tours. We had a lovely stay at Hostal Luz de Luna. The open rooves in the common area and kitchen area are great! The hammocks and greenery promote a relaxed vibe. Staff are friendly and helpful. Really cool place! Such a nice atmosphere. Breakfast was a little bit boring, but apart from that we were very happy with our stay. Really nice small hostel with a good location and really sweet staff even though she only speaks Spanish. But we got bedbugs! Very lovely and homely hostel with everything you need for a few nights. Only problem is it’s not particularly social as it’s always pretty quiet so not great to meet lots of new people. Really nice if you want a break away from everything though. Breakfast was nice and the staff are really helpful with booking tours and buses for where you want to go next!